Brisbane has come a long way recently. 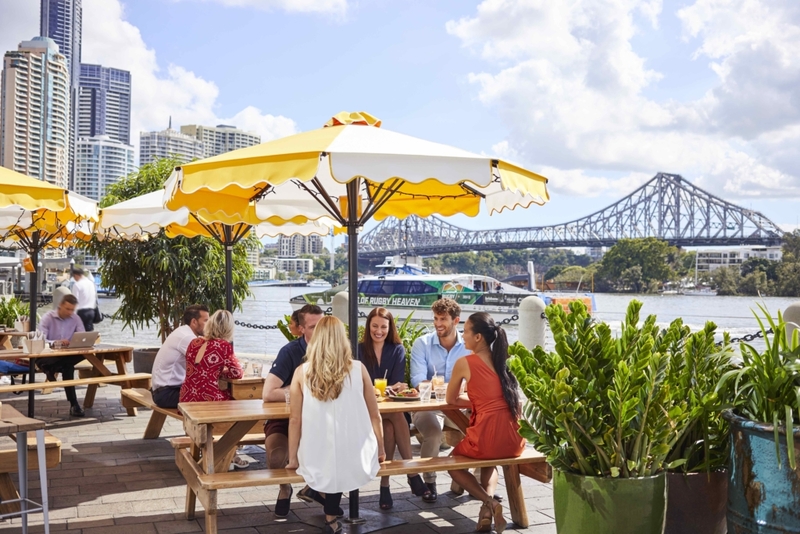 The sunny Queensland capital has long been living in the shadow of Sydney and Melbourne, but is now blossoming in its own right thanks to a burgeoning arts scene and urban regeneration which has transformed under utilised areas into vibrant entertaining hubs buzzing with bars, restaurants and characterful laneways. 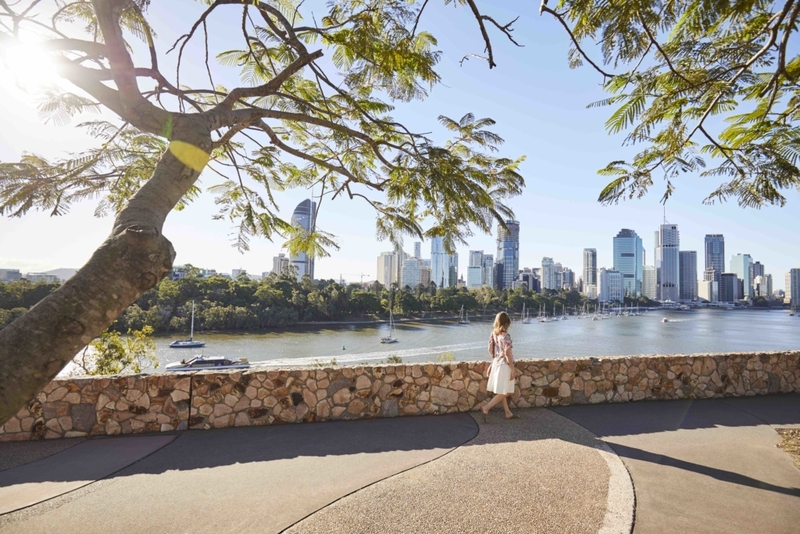 Whether you’re looking for a weekend of feasting, shopping or getting cultured, here’s a guide to make the most of your weekend in beautiful Brisbane. And with Jetstar operating direct flights between Melbourne and Brisbane, it’s the perfect time to start planning the next sunny weekender. Arrive in Brisbane via Jetstar and check in to Brisbane’s swanky Art Series Hotel: The Johnson, inspired by the vivid work of Australian abstract landscape artist Michael Johnson. Nestled in Spring Hill, the hotel is located conveniently on the door step of Brisbane’s vibrant CBD, the perfect base for a weekend of exploring. Spend the evening enjoying the buzzing dining scene of Brisbane. Start at Detour, one of Brisbane’s hottest dining destinations, where you can enjoy contemporary cuisine in the iconic Woolloongabba district. Chef Damon Amos’ menu is neatly divided into Omnivore and Herbivore, with the latter entirely plant-based and focusing on Australian native ingredients. On the Omnivore menu you can feast on gunpowder-seasoned salmon with green curry and black ants, pork belly with star anise, bean sprouts and pancakes or their signature dish – Kentucky Fried Duck with cornbread. Meanwhile, on the Herbivore Menu you’ll find a Hawaiian curry with sweet potatoes, coconut and lychee, coal roasted broccoli (miso, spinach, seaweed and quinoa and fossilized carrots (smoked almond, roast carrot and chia). Sounds interesting huh)? If you’re looking for a dinner more on the casual side, make your own detour to Ben’s Burgers for Brisbane’s best burgers, the Newstead Brewery for ultimate pub grub or Brisbane favourite the historic Breakfast Creek Hotel. Continue the evening bar hopping on characterful Fish Lane, which gives some of Melbourne’s laneways a run for their money. Don’t miss Maker, a Japanese inspired bar, home to some of Brisbane’s most creative cocktails using a variety of native ingredients. 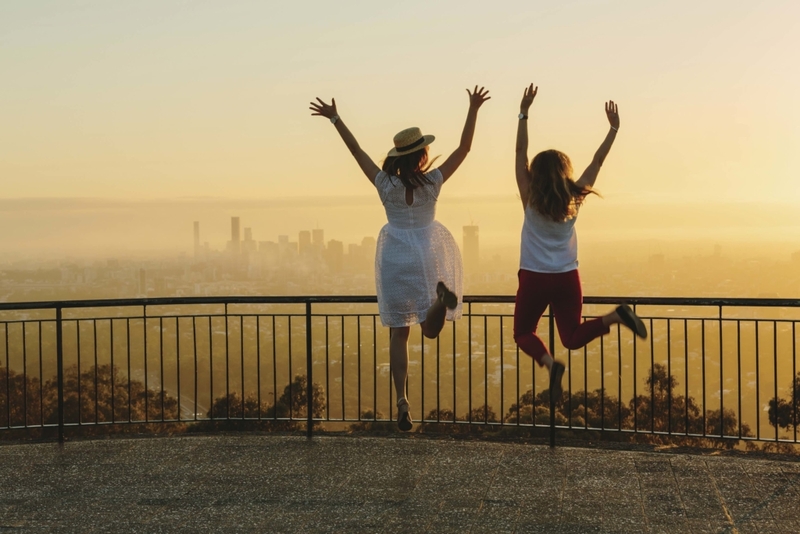 If you’re an early riser, make the most of the day and watch the sun rise over Brisbane from scenic Mt Coot-tha, a 15 minutes drive west of Brisbane’s CBD. The Look Out offers spectacular panoramic views over the CBD all the way to Moreton Bay. There’s also plenty of walking tracks throughout the park if you’re a fitness fanatic or, like me, you would prefer just to sit and relax at the lookout with a cup of coffee and enjoy the view, right? Have a wander around the magical 52 hectare subtropical botanical gardens and, if you have time ,pack a breakfast picnic. Spend the rest of the morning exploring Paddington, one of Brisbane’s prettiest suburbs and home to some of Brisbane’s best boutique shops, charming antique stores (don’t miss the Paddington Antique Centre) and op shops. One of the best places for breakfast in Brisbane is Naim Café, housed in a super cute Queenslander cottage. Here you can feast on Baharat waffles with roasted almond ice cream, baharat caramel, fresh plums, rose powder or the ultimate shakshuka, Tunisian style baked eggs paired with savoury tomato and capsicum sauce, saffron labneh, white beans, olives and toasted challah. I’m getting hungry just thinking about it! 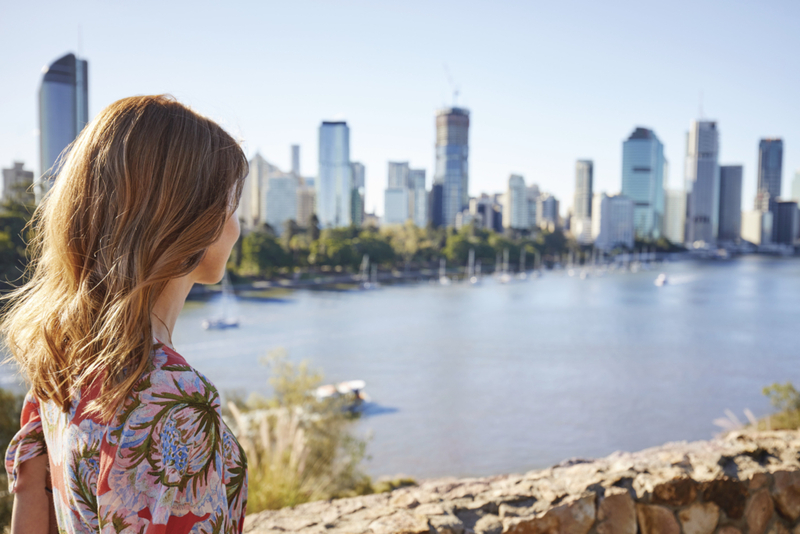 In the afternoon, explore Brisbane’s buzzing Southbank district. Stop for a drink at the Stoke Bar on the river before enjoying lunch at the Stokehouse. Here you can expect a contemporary Mediterranean-inspired menu which showcases premium local and Australian produce. The steak here is phenomenonal! If it’s a nice day, soak up the sunshine at the swimming pools and man made beach at Southbank. For the rest of the afternoon, go cruising on the Brisbane river. Hop on CityCat, Brisbane’s Ferry Network, to soak up all the Brisbane sights. 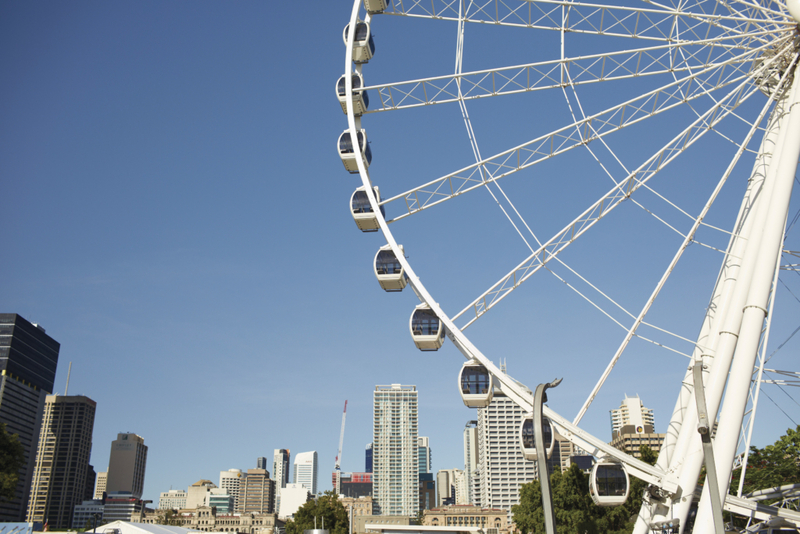 Once you have had enough of your sea (well river) legs, return to Southbank and go for a ride on the Wheel of Brisbane to see Brisbane from a higher perspective. If you have time, go for a walk through the Brisbane Botanical Gardens fringing the river bank, home to rose gardens, fig trees and giant jacarandas. Time to get a culture fix? The Queensland Art Gallery and the Gallery of Modern Art are the perfect places to get started. You could literally spend hours walking around the galleries and taking in the mix of historic and modern art and exhibitions. Experience Brisbane like a true local and venture to Eat Street on the Northside. Eat Street operates every Friday and Saturday night from 4pm to 10pm and Sunday 12pm to 8pm. Here you can take in the beautiful city and river views while eating, shopping and playing amongst 180 shipping containers converted to mini bars and restaurants offering a selection of dishes created by local chefs. But it’s not just about the food. Some of Brisbane’s best local artists and designers showcase their work here too. After you’ve eaten to your belly’s content, venture to Fortitude Valley, affectionately called ’The Valley’, for a night out. The perfect starting point is Eleven Rooftop Bar for sunset drinks if you can make it. Perched eleven stories high above Brisbane’s nightlife hub on Ann Street, Eleven Rooftop Bar boasts impressive 270 degree views of Story Bridge and the CBD, sweeping west to Mt Coot-tha. Some more fun bar options are Gerards Bar Greaser for a, American rock’n’roll vibe or late-night burgers and whisky in Gresham Lane. After a mini sleep in, head to the Soul Pantry for breakfast. Located on the banks of Kedron Brook and Grange State Forest, it’s the perfect sanctuary to relax with a cup of coffee and delicious local produce. Don’t miss the beautiful florist shop inside. Grab a bike and go for a cycle along the creek and stop by the beautiful Roma Street Parklands and Spring Hill precinct. Discover the 16 hectares of stunning parklands, full of winding paths, lakes, tropical gardens and gorgeous flowers. 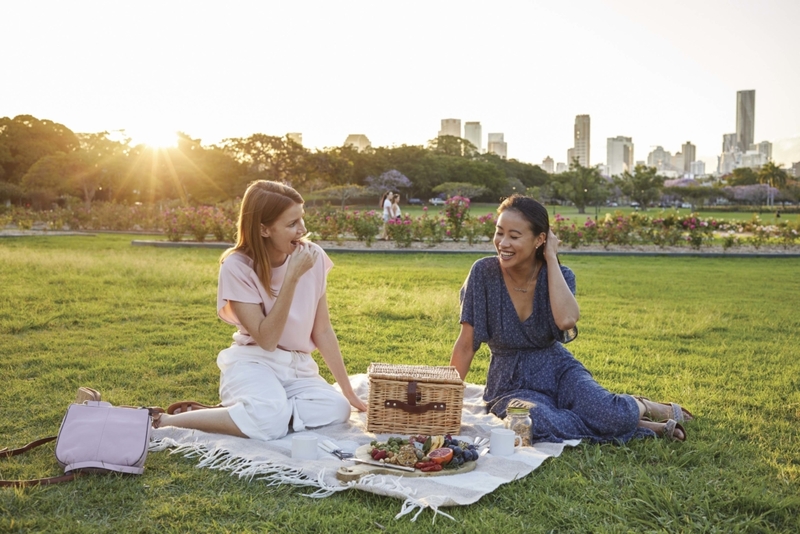 Pick up some local produce from Spring Hill and enjoy a picnic in these lush surrounds. This article has been written in partnership with Jetstar Australia. Words by Lisa Holmen, Images by Jesse Smith & Jen Mendez.